Today I came across a very inspiring article based on the life of a man who dared to dream and attempt the unattempted. Fortunately, the article is long enough to share part of it with you and show you the link to read the entire article. Below is the part I got out for you. Few people have changed this world to the magnitude that Walt Disney has. He proves that circumstance and education do not dictate what you can become. His life lessons serve as excellent reminders for young entrepreneurs. 1. You must be a salesman. Sales gets a bad reputation, but make no mistake, selling is the most important skill you can master. And as Walt said, dreams take money and money comes from selling. 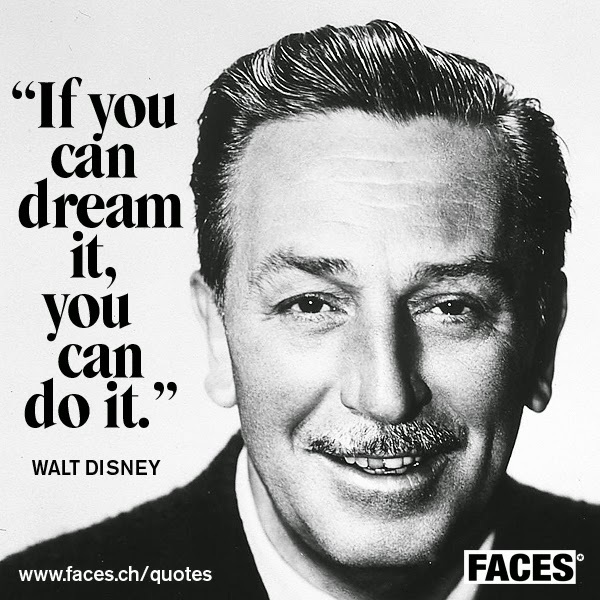 Walt believed in himself and his dreams and could therefore convince others to believe in him too. Halfway through making Snow White, Disney ran out of money to finish the film that was termed “Disney’s Folly.” Even his own family begged him to give it up, but Disney was undeterred. He personally traveled to different producers and showed them the raw footage and convinced them to finish financing the film. Snow White became an instant success and ushered in the Golden Age of Animation. To finance attractions at Disneyland, he persuaded the television studios to finance building the park in exchange for original Disney programming. Guess what the programming was? It was basically an advertisement for Disneyland! This genius plan not only financed the park, but by the time it opened there were millions who couldn’t wait to go! It proved to be one of the most successful media campaigns ever done and it helped grow Disneyland into the international destination it remains today. 2. Leadership is inspiration, innovation and focus. The key to Walt Disney’s leadership is that he was an incredible storyteller. It’s one thing to tell your employees to do something, it’s another to inspire them to action. Walt would tell them a story. He would go into extreme detail and make it come alive for them. He would inspire his workers and make them a part of that story and as a result he would get more from them. When he was first pitching his animators on the story of Snow White, he went through the entire story, acting out the characters, even doing their different voices and movements. Walt had a unique ability to hire people more talented than he was and to focus and coordinate their attention towards a common goal. He admitted that he was a terrible animator. So he hired the best he could afford and focused on innovating the company. He also knew his workers. He knew what they were capable of and didn’t accept anything less than their best. He may not have been quick to compliment, but he was always clear about what he visualized and expected. 3. Always be constantly improving.